Remember making an old fashioned leaf rubbing? We all did them when we were kids, right? Turning the crayon on it’s side, rubbing it over paper with a leaf under it, and watching the details of the leaf “magically” appear was a staple of fall arts and crafts time. This simple leaf art project is a new twist on an old favorite. Short materials list and an easy process make this an ideal project for any age or skill level. This part is so easy. You need watercolor paints. Old fashioned dry cake watercolors will work just fine. If you wanna get fancy you can also use liquid watercolors. We tried both with pretty similar results except the liquid watercolors are slightly more vibrant. You will need plain white paper. I’m a big fan of giving kids quality art supplies. Usually I’m all about nice heavy paper. In this case, because we want the details of the leaf to come through, lightweight paper is best. Even copy weight paper will do. Gather some leaves. It’s summer here so there are plenty of leaves to choose from but some types of leaves worked better than others. Some leaves were too “squishy.” When we tried to rub the crayon over them it crushed them, leaving a green print from the leaf itself on the paper. Some of our larger hosta leaves did this. The leaves that worked the best for us were small fern fronds and maple leaves. I would guess that most tree leaves will work well. If you’ve got extra leaves laying around try this project or this one! Easy and such a great way to explore making art with natural items! 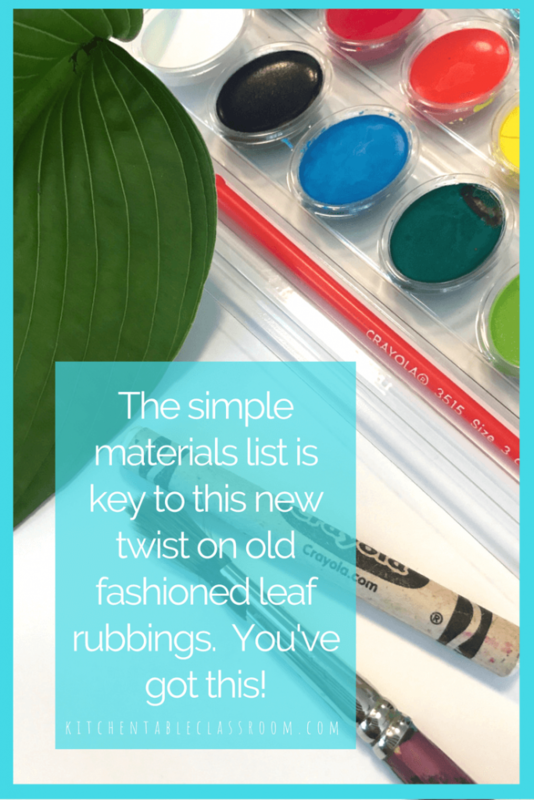 The leaf rubbing part is just like you remember doing when you were a child except for one thing; we are only using white crayons! Lay a leaf under your paper, turn your peeled crayon on it’s side and rub back forth over the paper. Move the leaf, or choose a new leaf, and do it again. Leaves can go off the paper and overlap. White crayon on white paper means that this part is less than impressive. Your leaf rubbing is just barely visible at this point. It’s hard to keep track of where your leaf rubbing is, but that’s okay. Let kiddos move and overlap and keep making their leaf rubbing till they’re content. It’s perfectly acceptable for the crayon rubbing to go off the page or to overlap each other. Kids may not even be able to tell where the leaf rubbings are and that’s okay. This leaf art allows for lots of wiggle room and will still turn out beautiful results! 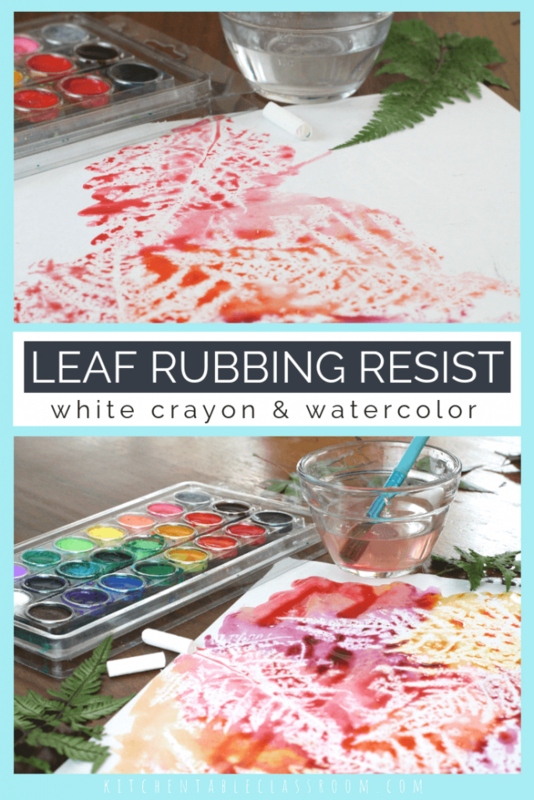 Leaf rubbing and watercolor resist…..
Now you’ve got white paper with white leaf rubbings. As of now it’s a pretty subtle look. Enter the fun part. Using whatever watercolor paints you have chosen encourage kids to paint over the entire paper. 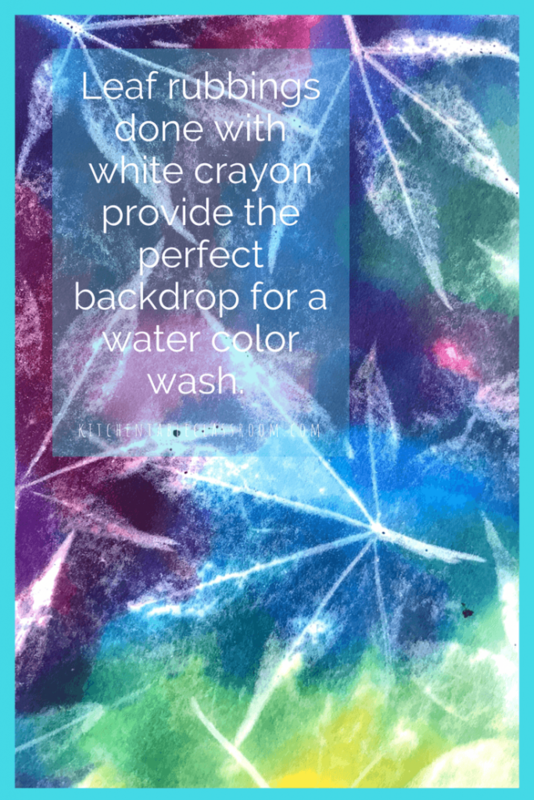 Ghost white leaves will literally “pop” right out of the watercolors paint. This could be a place for a mini lesson on warm or cool colors. (Check out this post for a sweet color theory printable.) We just painted whatever struck our fancy. A couple of notes for little hands. Using watercolor on lightweight paper requires knowing when to quit. It is easy to “paint” a hole in the paper. Scrubbing the paper will both make a hole and soak the paper to the point that the crayon resist is no longer visible. Quick hands and a light touch are what you want! New life to an old favorite…. Adding watercolor wash to the crayon leaf rubbing done in white brings new life to an old favorite! This us a super simple activity that your kids will most likely want to do more than once. That’s the beauty of it. Show them the idea, set them loose, and let them create over, and over! 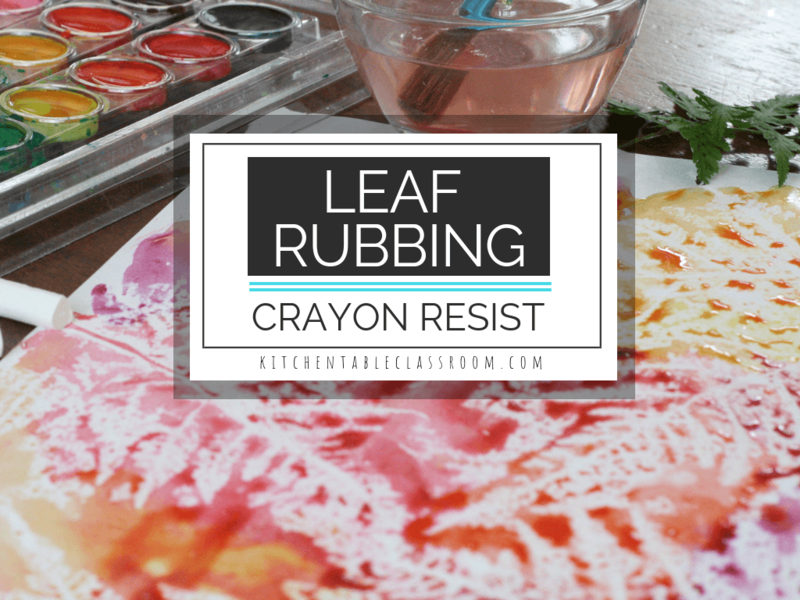 Try crayon leaf rubbings in colors or sub out the crayons for peeled oil pastel crayons. Little tweaks to this leaf rubbing will allow kids to make it their own and keep the creativity flowing! 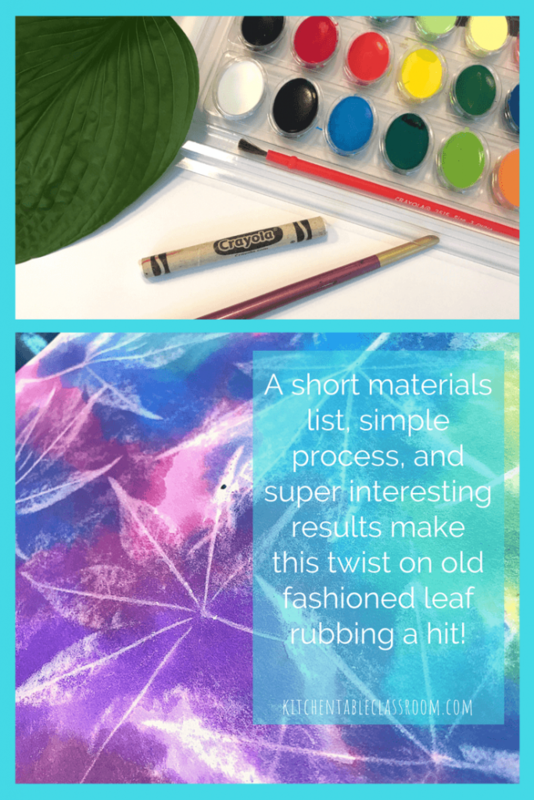 While you already have all those beautiful leaves gathered up for inspiration check out this post about drawing leaves in glue and chalk. It’s a totally different take on the same subject and has such bold results! If you enjoyed this leaf rubbing project please share it on your favorite social media channel! Every single share helps me to bring you more fun hands on projects like this leaf art and free printable resources! Thanks for the background idea to my next mixed media project. It is pretty funky. The part that made me laugh about your instruction is when I got to this part: “The leaf rubbing part is just like you remember doing when you were a child…” I have zero recollection of doing this as a child, and when I read that last line I thought you were going to abandon the lesson right there. Now that you have gathered your paper, paints, leafs and crayons, do the thing you remember doing when you were a kid. Ha ha! Jasmine~ haha. Seriously, am I the only one? I feel like I remember doing this at every art class, Sunday school, VBS, & camp activity ever! I’m glad you found a way to use it! This looks great. I just have 1 question. Could you use dye instead of water colour paints? Would this work the same? The key is that the crayon or oil pastel resists the watercolor paints and still “pops” through. I’m not sure what kind od ye you’re thinking of or if the oil pastel would resist it. I’d suggest trying it with a tiny sample so you don’t have too much time invested if it doesn’t work!